The infamous hell-raiser and much lauded drummer who came to international fame with Cream, Blind Faith, Fela Kuti has spent the last few years playing the music he first came to love, Jazz. For Drum Legends he'll put the Cream repertoire centre stage. Herman ‘ze German’ Rarebell joined Heavy Metal giants The Scorpions in 1977 and went on to write many of their most popular hits, including Another Piece of Meat, Rock You Like a Hurricane, Blackout and Arizona. He's active with band mates like Michael Schenker and also with his own band. He is one of the most important names in the rise of Hard Rock. Is best known for his work in the The Spencer Davis Group, who released several top hits of the 1960s such as Keep On Running, which reached Number One in 1965, followed by Somebody Help Me, When I Come Home, Gimme Some Lovin’ and I’m A Man. He went on to perform with Eric Clapton’s Powerhouse, Blues Circus and over the decades many other groups and projects including hosting and producing the TV series Superdrumming and Villa Fantastica about drummers and music. The Scorpions and The Spencer Davis Group. These three iconic rock powerhouses will take centre stage with their expert band behind them: showcasing hits from their stellar careers such as White Room, Gimme Some Lovin’, Rock You Like A Hurricane, Passion Rules The Game and Sunshine Of Your Love. The fun won't stop there as they will spar against each other taking drum battles to new heights. 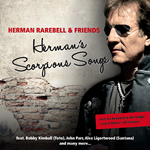 THE ALBUM "HERMAN'S SCORPIONS SONGS"
THE ALBUM "TAKE IT AS IT COMES"